Lactose Intolerance (LI) is defined as the inability to completely break down lactose due to a lack or reduced production of lactase enzyme by the small intestines. This is also referred to as Lactase Deficiency. 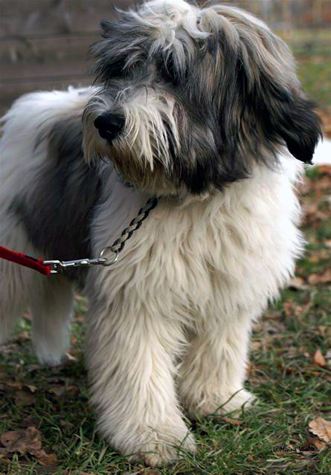 It the most common type of Carbohydrate Intolerance and a possible trigger of digestive upsets in a considerable number of Polish Lowland Sheepdogs. In a review by Gudmand-Hoyer,published in The American Journal of Clinical Nutrition (1994), The prevalence of primary lactose deficiency varies and reaches almost 100% in some Asian countries among human beings. This coincides with Polish Lowlands originating from Tibet and carrying genes for being double coated, herding and apparently Lactose Intolerance among a significant number of the current population in Europe and the USA. Vomiting - unexplained vomiting after digesting foods with dairy, etc. In PONS, the most common symptoms are diarrhea, flatulence and vomiting. Owners are often at a lose as to how to cope with the above symptoms. A veterinary test will confirm this condition and a change of diet may be necessary. Reactions to dairy products may vary and not all PONS need to avoid yogurt and foods which contain varying levels of lactose. Foods containing starch and gluten may also produce symptoms similar to lactose intolerance. There are different types and degrees of this condition and it may take a number of food trials to determine an individual PON's reaction to individual foods. Consequently, an elimination diet may prove most helpful. This condition cannot be ignored because it may result in canine malnutrition in it's extreme form. Home cooking may prove most helpful because ingredients can be controlled. Consider working with a qualified canine nutritionist for a well balanced diet. Sheepdogs as a group, are known for sensitive digestive systems and it is an advantage to network with owners of other sheepdogs about digestive issues. There is often no quick fix and it is important to use common sense and professional veterinary care when addressing health issues.